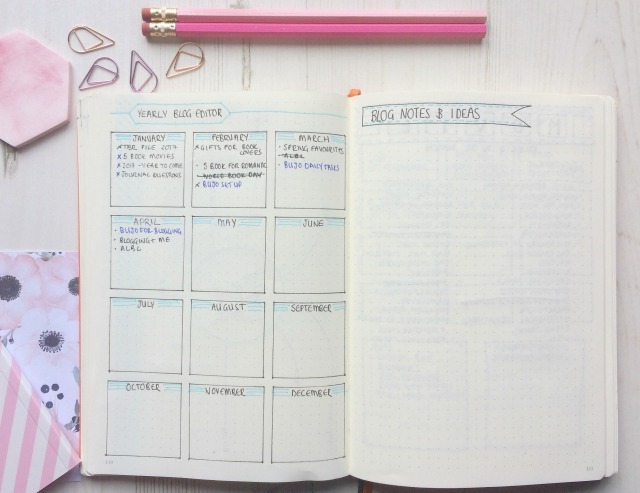 It’s been a while since I wrote about my Bullet Journal but I’m still using it regularly and since I started a simple monthly setup I find it so much easier to keep on top of everything. This helps me keep track of personal events and day-to-day jobs. However, when I set up this new year I popped in a few pages to help plan my blogging and keep on top of work that needs doing on it. I’ve found most of them helpful, especially when it comes to planning my posts so I thought I’d share a few of them. Right at the beginning of the New Year I started my Big Blog To-Do List and a mind map for the coming year. The big to-do list is one of my favourite things, it’s mostly all admin tasks or things I’d like to try. Most of my blogging time is taken up with writing posts and commenting so this is for all the extras I’d like to do if I have the spare time to do it. If I think of something I need to do but don’t get chance right away it goes on this list so I’ve got a log of ongoing things. As you can see I haven’t done much with the mind map yet! I did one last year when I wanted to refresh the blog and I found it really useful to get out whatever was going through my head at the time. I’m always ready to do a little update around September so it might not get used properly until then but again it’s somewhere to jot down ideas when they come to me. Next I drew up a yearly blog editor calendar which I thought would be useful to mark down post ideas in advance. So, I use for recurring monthly posts or anything month or season specific like Valentine’s Day or Halloween. 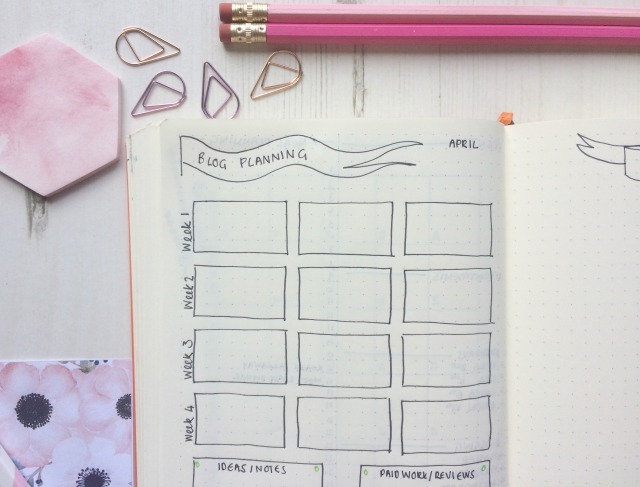 The idea being that I can plan in advance if I want to write a post to fit in with an event or season – in reality I am very rarely that organised but I like being able to jot I few ideas down on here as I go along. Alongside it I left a blank page for ideas – I’d planned to use it as a bit of a mind dump but as you can see I haven’t been hit by any inspiration yet! I also updated my Instagram and Blog Love pages, I’d found these useful last year but they needed refreshing. The Instagram is just lists of hashtags I like to use as I constantly have a blank when I’m posting a new photo – this needs adding to again as there are a few new ones I haven’t got on there. I have a section for friends hashtags so I can try to support communities of my IG friends, there are some lovely ones out there. My Blog Love page is an ongoing lists of blogs I like to read, it’s a list of blogs that really inspire me and I like to pop by and have a read of now and again. It’s not really about following them religiously or commenting, they are just blogs I love to read for me personally. I’ve covered it up only because it is ongoing and I’m sure there is some I’ve missed off! If I’m feeling a bit meh about blogging reading a few of these usually cheers me up. Every month I setup my monthly blog calendar. I love, love, love my blog calendar – I think I’ve shared it before but it really does help me to plan out my posts. I don’t often manage three a week but that is something for me to aim towards and I track any ideas or paid work on this page too. I get it ready at the start of the month and fit in any posts I know I want to do then I can slot in anything else as it comes up. It’s probably the most useful page in my whole bullet journal and I’d be lost without it now. My blogging stats I track each month in my monthly spread. I’m not too bothered about the numbers game but they are handy to have month on month and if I’m doing woefully badly on any platform (hello Facebook!) I can see it here. These handful of pages have really helped me stay on top of my blog this year and even when I’m not blogging often I feel like I can come to these pages and plan some ideas. 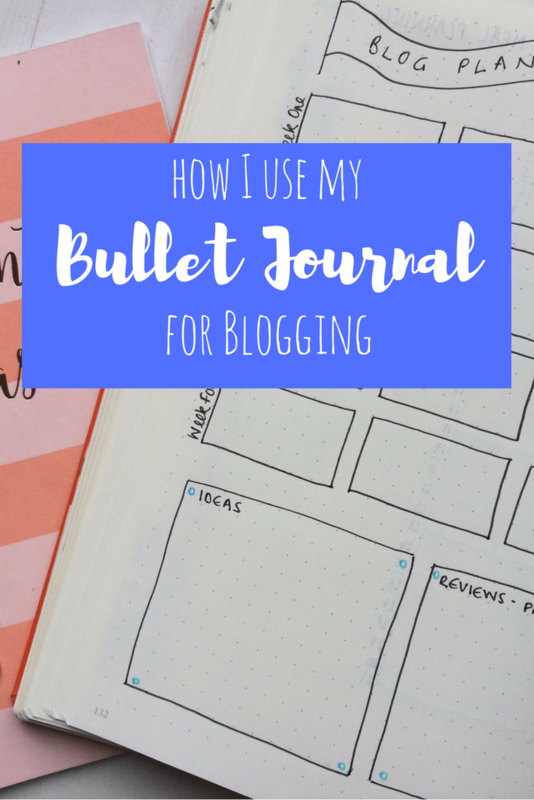 I’d love to know what you use in your Bullet Journal to stay organised and especially if you you use it for blogging! Great post. I restarted my bullet journal this month and need to do my May spreads tonight. My blog planning page didn’t work as well as I hoped. I think I may try your way this month. I’ve been doing it for a nearly a year now and I still change things each month, when I find something that works I stick with it but otherwise I just move onto something new, that’s why I love the Bullet Journal. Good luck getting back into yours! This is really interesting, Hayley. I love seeing how other people plan. 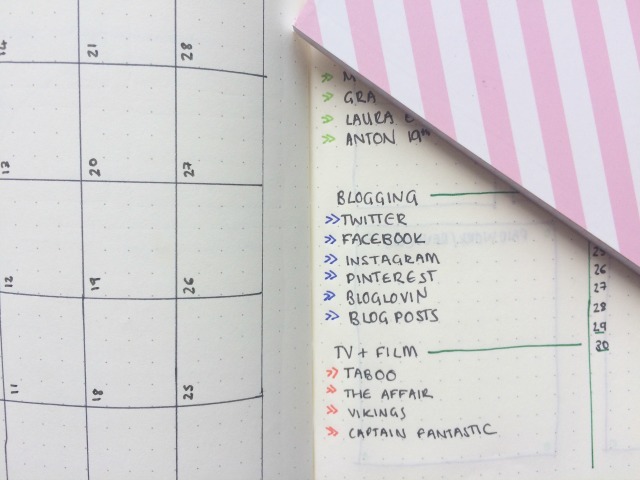 I’m pretty organised but and always have a bank of posts in the back of my mind, but I could probably do with a better monthly plan rather than weekly, and also keep note of the little admin jobs that need doing (but which I rarely find the time for). I love your bullet journal so much, mainly because I’m such a big doodler and this, to me, is the ultimate reason to doodle and makes such a fab keepsake for the year. One of my friends brought round all her mums l’d diaries and journals and they were amazing! I hadn’t thought about keeping them until she did that but I love that they are a real moment in time! 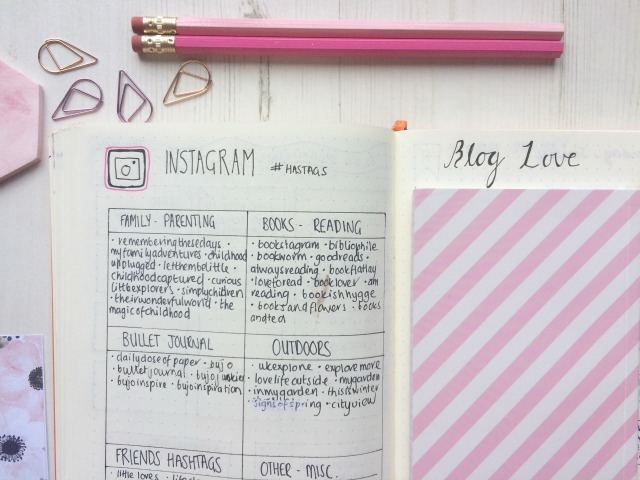 I love seeing how others plan their ‘blog work’ I use a blog planner rather than a bullet journal but use many of the same techniques as you. In fact you have prompted me to do some proper planning for May tonight! Loving these spreads – So creative. I need to keep up to date with mine. 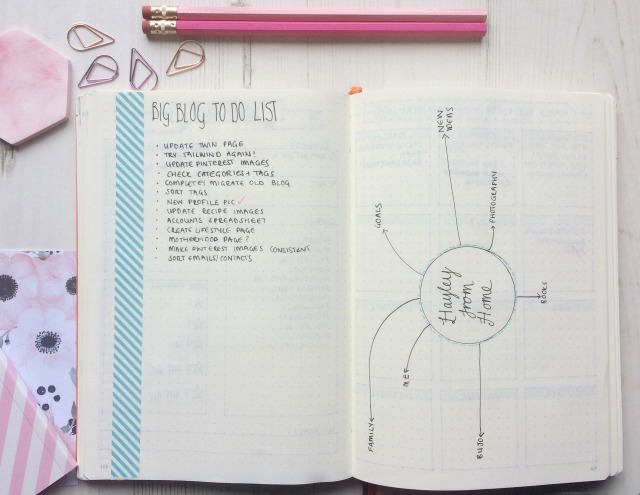 I think it is a great way to stay organised with life as well as my blog. Thanks Vicki, I’m having a good spell of using it at the moment but I don’t always keep it up.